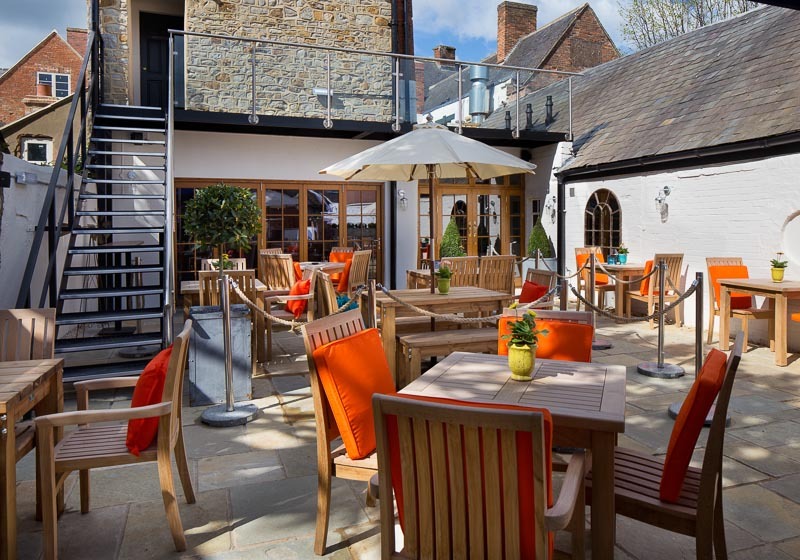 This award-winning former 18th Century coaching inn in Shipston-on-Stour is a chic gastropub with rooms and a lovely, sunny beer garden. A stylish suntrap at the rear of The George. Bang in the centre of the high street in charming and friendly Shipston-on-Stour on the Warwickshire-Cotswolds border, one of The Sunday Times 2018 best regional places to live in the UK. This unspoilt little market town is 10 miles south of Stratford and has a lovely old-fashioned feel to it with tea shops, butchers, fishmonger, bakers, a bespoke tailor and lots of delis. Well hello! 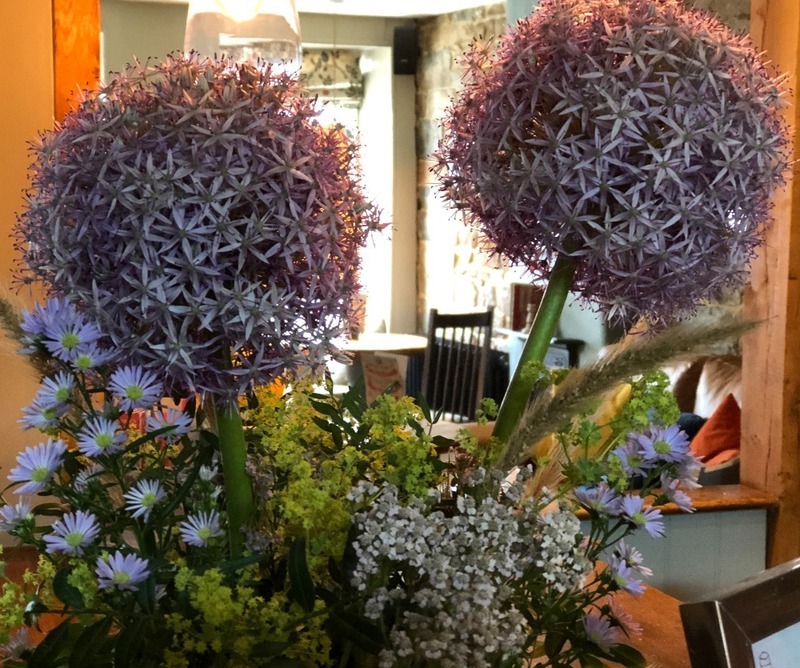 This gorgeous bunch designed by local florist Lucy Walker greeted us as we walked into The George. Eclectic, buzzy and stylish. 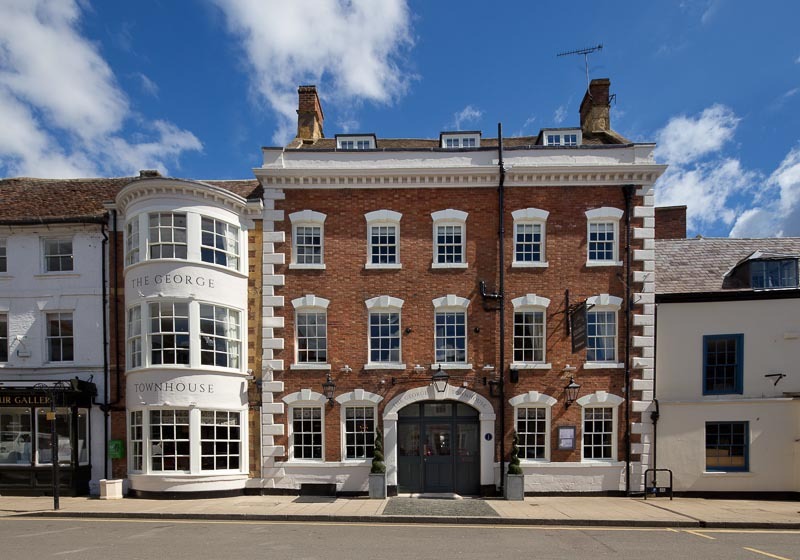 The George Townhouse, part of the Brakspear pub group, has nailed contemporary kitsch-chic with its elegant collection of 18th Century Georgian rooms. Each has its own character and individual decor in cool, contemporary colour palettes ranging from light and dark charcoal greys, to bright reds, rich blues and ochre. It goes a long way back from the high street and feels spacious. 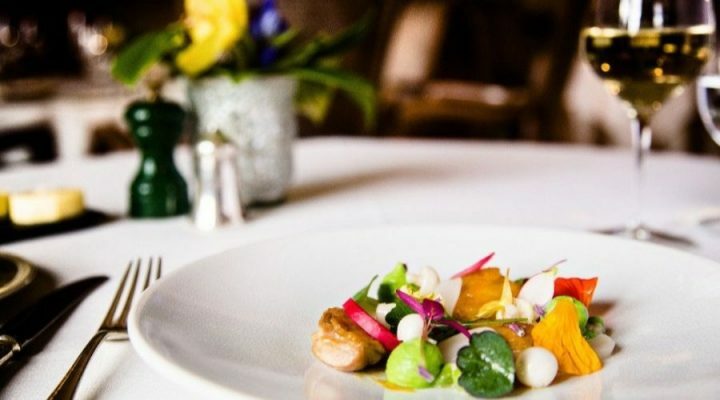 There’s no shortage of places to eat including the bijou Carriage Room – for private dining up to 12 – the Parlour, great for large gatherings, and two restaurant areas, the Pantry and the Garden Room overlooking the back terrace. 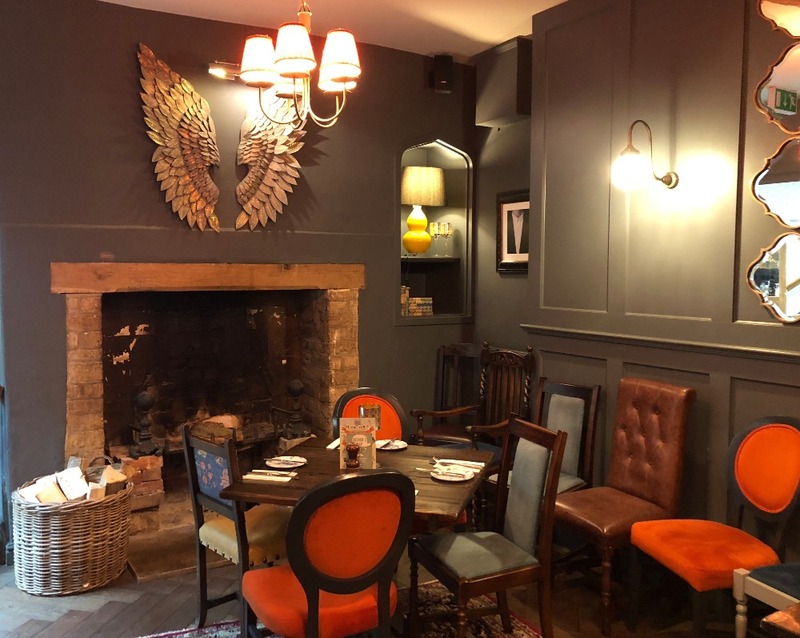 For more relaxed dining there’s the cosy snug (below) with its carved stone fireplace, antiques and beaten up leather armchairs. 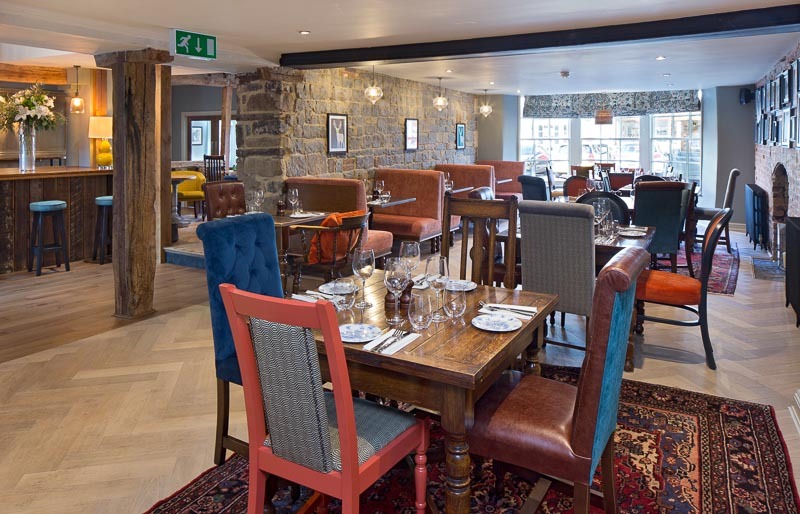 A cosy snug with leather armchairs in the bar area and a touch of kitsch. 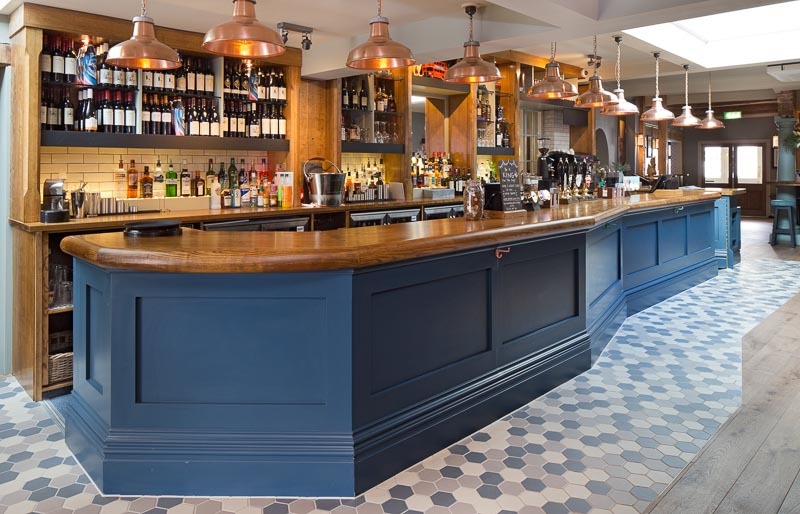 The long blue bar, fitted out with eye-catching copper light fittings, wooden tables and colourful stools is at the heart of the establishment. 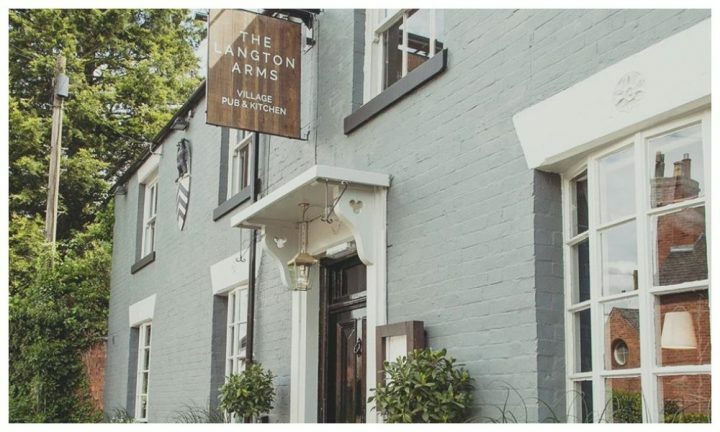 In 2017 The George won Best Warwickshire pub in the National Pub & Bar Awards and is a Warwickshire Muddy Award 2018 finalist in two categories (Best Destination Pub & Best Boutique Stay) to boot. 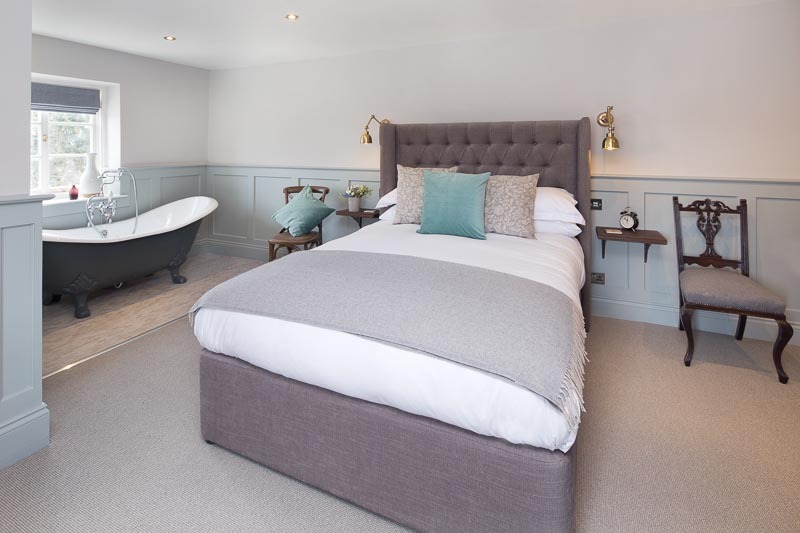 A couple of years ago The George underwent a massive facelift, including the 15-en suite bedrooms. 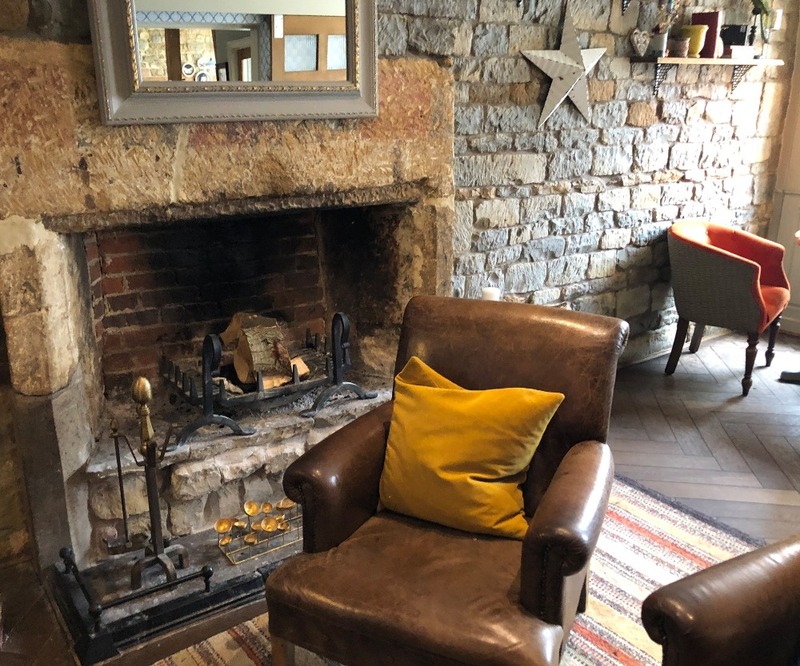 This refurbishment hasn’t taken anything away from the quirky characterful charms of the listed building like the reclaimed oak floorboards, exposed stone walls and wooden beams. 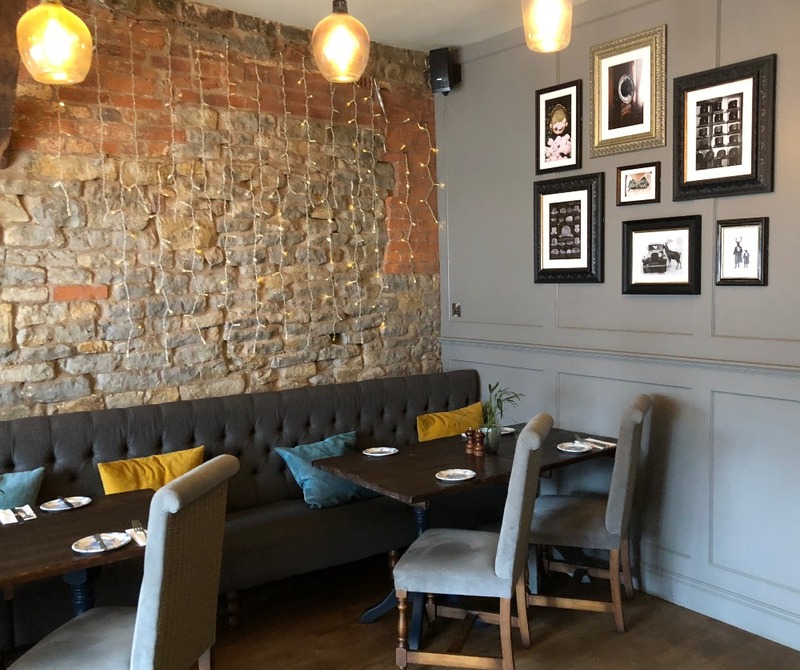 Food is taken seriously at this welcoming, unpretentious country gastropub with locally sourced ingredients and and a menu of hearty modern British dishes. 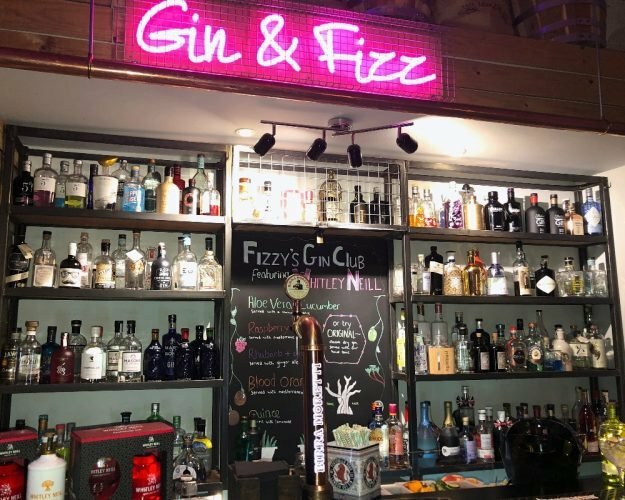 The tipple of choice is Cotswolds Gin with Fever Few tonic plenty of ice and a wedge of pink grapefruit or home-grown lavender as the distillery is just 5 miles away. It’s one of 10 speciality gins. The Pantry. We sat in the window. Muddy’s sales manager Jayne and I drove over to The George for a mid-week ‘working’ lunch with my mum and nine-year-old nephew, who were visiting. Jayne picked something she wouldn’t normally cook at home, Pan Roasted Scallops with chorizo and grated apple, to start, followed by Salmon and Dill Fishcakes with Wilted spinach in hollandaise and triple cooked chips on the side. The portions were generous, she wasn’t expecting two fishcakes! She said it was lovely and tasty, complimented by a glass of refreshing Rose. 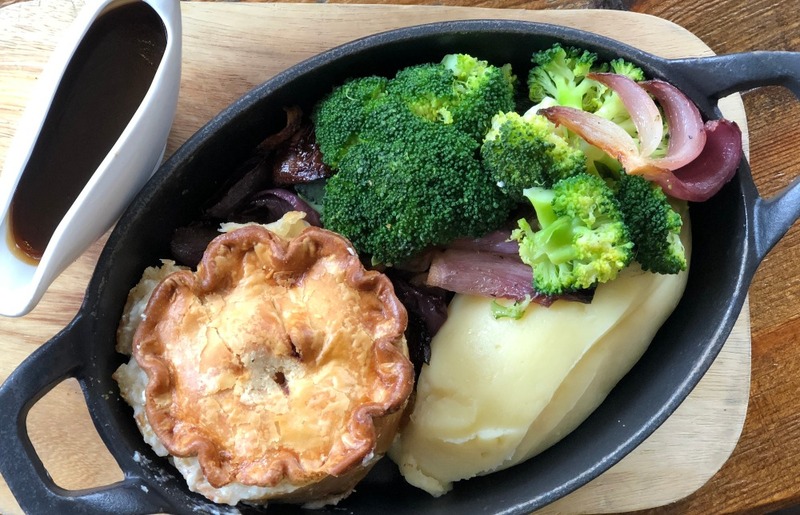 My mum just fancied the Pie of the day – Chicken, leek and ham – which came with mash, onions and steamed broccoli. She does a lot of home-baking and admired the light flaky texture of the pastry. I went for one of my favourite starters, Salt and Pepper Squid, with charred lime and aioli. They were very good, my nephew agreed. For the main event I was torn between the Baked Aubergine and the Chalk Stream Fillet of Sea Trout, and opted for the latter. It was very colourful and beautifully presented on a turquoise stoneware plate on a bed of wild rice alongside edamame, grated carrot, beetroot, avocado, seasoned with lime, miso and teriyaki. It was simple and delicious – every bit as good as it looked. Our waitress recommended a glass of flavoursome Beyond Sauvignon Blanc from Constantia, the coastal region of South Africa. There was very little room for puds but Jayne and I soldiered on (I know, it’s tough), She ordered the Passion fruit and lemon posset with almond crumble (just the right amount of tartness) and I had Neatened Eton Mess Chantilly cream, strawberry ice cream, strawberry coulis. It felt like a more summery choice than the warm treacle tart. Yum! 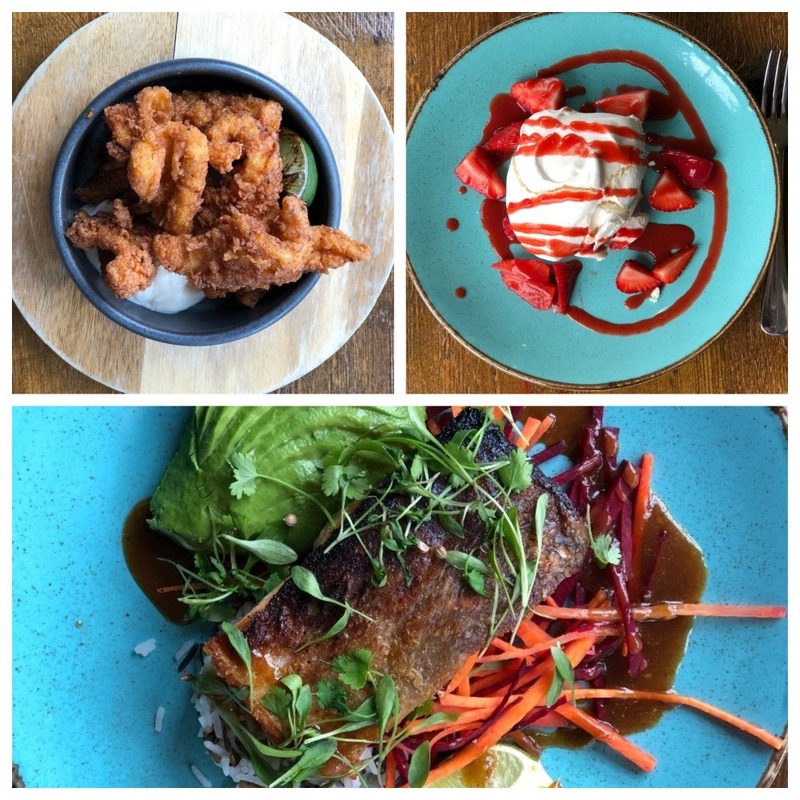 You can check out the new summer menu here. Children have five menu choices here including salmon and herb fishcake, grilled halloumi and battered haddock. My nephew knew straight away what he wanted: the beef burger and chips. 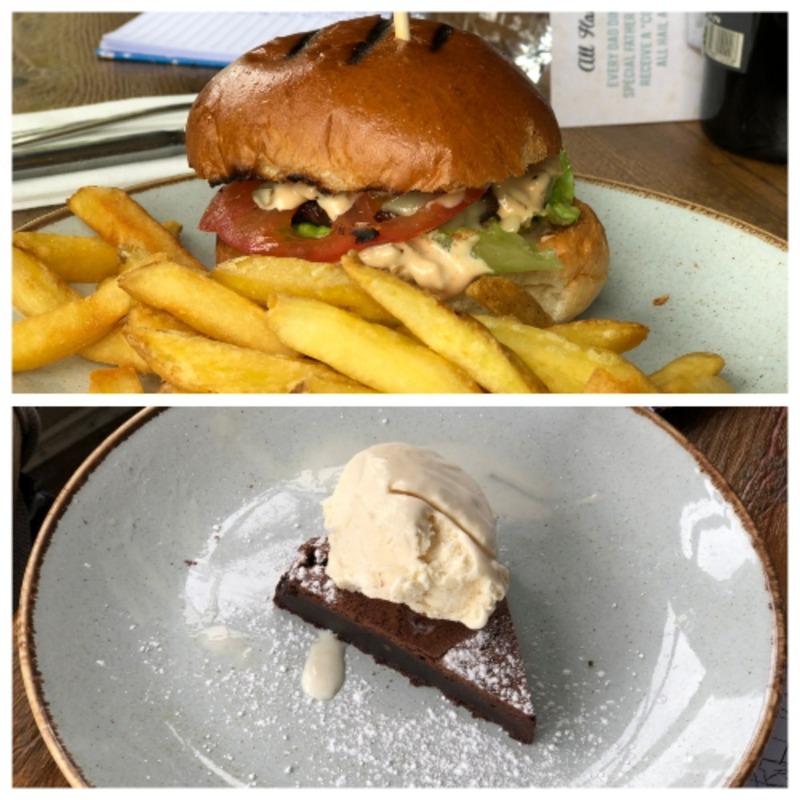 And for pudding – Hot Belgian Chocolate Brownie with a scoop of ice cream. He devoured both with relish! There’s a lovely terrace outside for sunny days but no big garden to roam. During school holidays on weekdays between 12noon and 3pm kids aged 12 and under eat free with every adult ordering a main. Not only is The George a great place to eat and drink, it’s definitely worth checking in for an overnighter for not only are the 15 period rooms gorgeous (and quirky, our favourite combo with thoughtful touches) set over three-storeys, you’ll get the opportunity to relax, kick back and recharge your batteries. And the full English breakfast made with locally-sourced ingredients sounds amazing! Each has a Nespresso machine, TV, free WiFi and a funky, retro phone. Décor is in soothing greys with splashes of colour from bright cushions, geometric wallpaper and throws. Deluxe Plus rooms and the suite include roll top baths and a separate shower. All have aromatic Temple Spa toiletries. 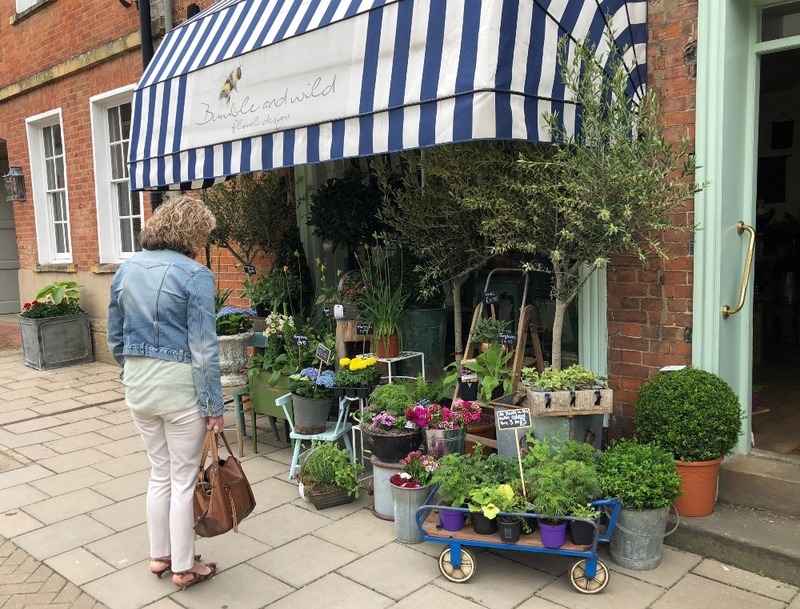 Shipston-on-Stour is a lovely, unspoilt market town with many small, independent shops so if you’re staying at The George it’s worth making some time to have a stroll. It’s also known for its two-week Proms music festival (now until June 30) and annual Bank Holiday Wool Fair – in aptly named Sheep Street! You’re a short drive from Stratford-upon-Avon if you want a Shakespeare-themed day out or a theatre trip. Whichford Pottery, a family-business making handmade British flowerpots, is just outside town. Daylesford Organic Farmshop, Sezincote, Cotswold stone villages like Bourton on Water, Which and Blenheim Palace are also all a stone’s throw away. Good for: A stylish British bolthole for a chilled romantic weekend away enjoying countryside walks and working up an appetite for supper. If you love your gin a Cotswolds Distillery tour is a must and Wychwood Brewery makers of Hobgoblin, also offer guided tours. It’s dog-friendly with two rooms available to accommodate your pooch and cyclists are welcome. Not for: Anyone expecting a wild night of clubbing. Instead drink in the lively atmosphere at The George with live music sessions, Pie Monday’s and cocktail nights. The damage: For the quality, this is great value. Starters hover around the £6 mark, mains between £10 and £24 and puddings are £5.50 – £8.50 for The George Cheeseboard. Deluxe rooms from £140-£160 per night. 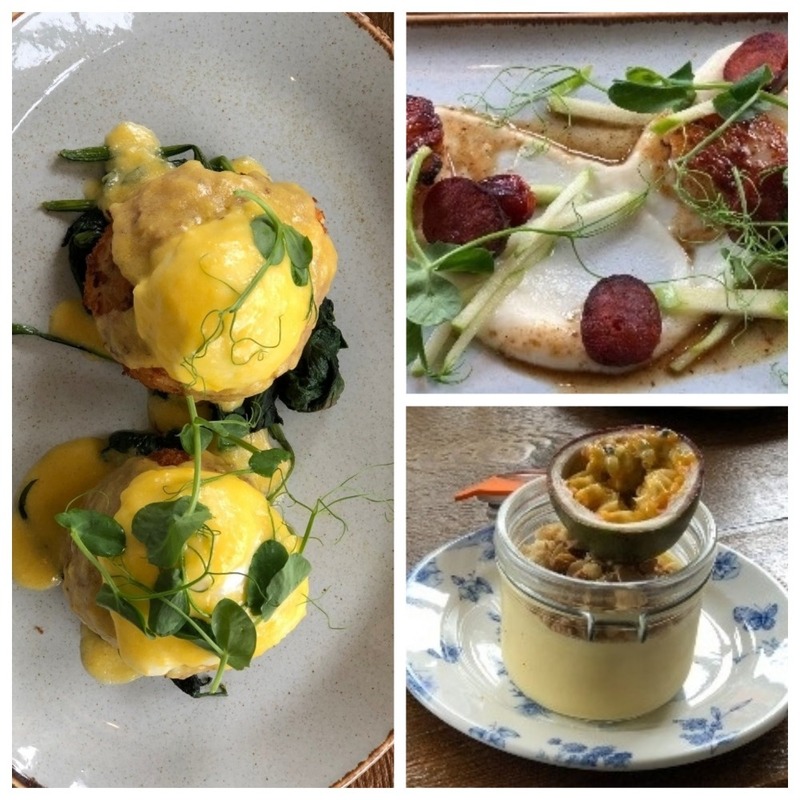 Book direct and breakfast is included (book@thegeorgeshipston.co.uk). The George Townhouse, 8 High Street, Shipston-on Stour, Warwickshire, CV36 4AJ. Tel: 01608 661 453.